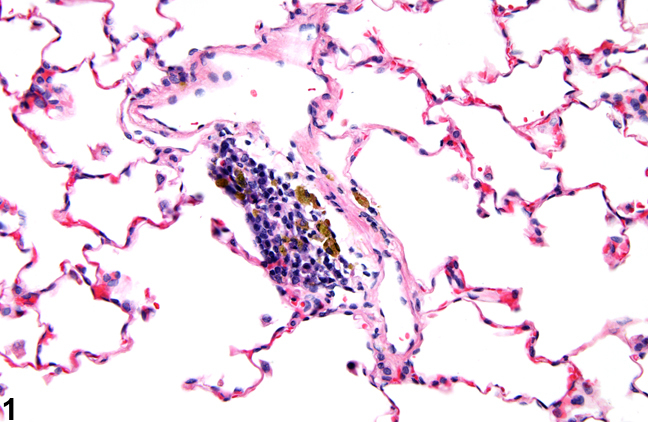 Lung, Alveolus - Pigment in a female Harlan Sprague-Dawley rat from a chronic study. The pigment is most likely hemosiderin and is contained within macrophages. Lung - Pigment in a male F344/N rat from a chronic study. The golden brown pigment is most likely hemosiderin secondary to hemorrhage associated with acute inflammation. The term "pigment" is reserved for endogenous substances. Various types of pigment can be seen in the lungs, including hemosiderin ( Figure 1 and Figure 2 ) and lipofuscin. Test agents that appear as brown to black material in the lungs should be diagnosed as foreign material rather than pigment (see Lung - Foreign Material). Hemosiderin is the most common and most important type of pigment seen in the lungs. Hemosiderin appears as finely granular, golden brown material in macrophages. When alveolar macrophages ingest erythrocytes, as occurs with hemorrhage, the hemoglobin is converted into hemosiderin, the most stable storage form of iron. Hemosiderin is seen following hemorrhage, which can result from vascular congestion in the lung (as occurs, e.g., with congestive heart failure) or vascular injury. Acid hematin, an artifact of fixation in formalin with a low pH, appears as black to brown amorphous to microcrystalline granules and can easily be confused with hemosiderin. Acid hematin is produced by acid acting on hemoglobin, so it may appear in areas of hemorrhage. The presence of hemosiderin can be confirmed with the Perls’ Prussian blue staining technique. 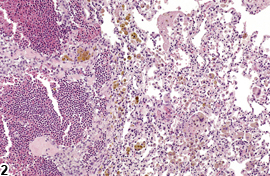 Lung - Pigment should be diagnosed when it is considered to be relevant to the study (or if it is unclear whether it is relevant to the study) or if it is unusually prominent. Not all pigments have to be diagnosed, as some are ubiquitous in aging animals or are secondary to another disease process (e.g., hemorrhage) and not toxicologically meaningful. The pathologist should use his or her judgment in deciding whether or not the pigment should be diagnosed. 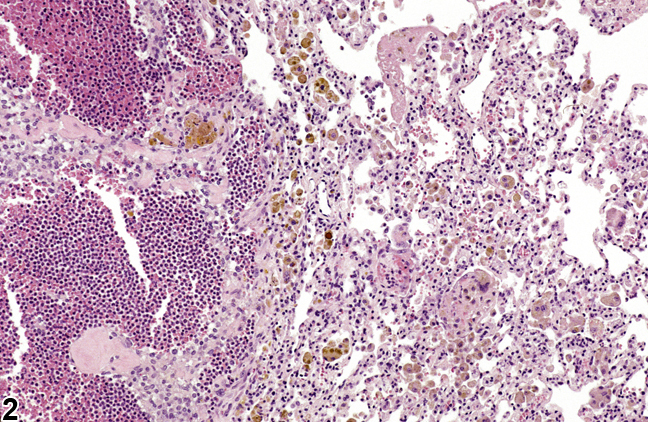 When pigment is diagnosed, it should be given a severity grade, and if appropriate, a site modifier (e.g., bronchus, bronchiole) should be used to identify the location of the lesion. Definitive pigment identification is often difficult in histologic sections, even with a battery of special stains. Therefore, a diagnosis of pigment (as opposed to diagnosing the type of pigment, e.g., hemosiderin or lipofuscin) is most appropriate. The pathology narrative should include a description of the morphologic features of the pigment, its distribution within the tissue, and the cell type affected. Associated lesions, such as hemorrhage, alveolar macrophage infiltration, or inflammation, should be diagnosed separately. Kumar V, Abbas AK, Fausto N. 2005. Cellular adaptations, cell injury, and cell death. In: Pathologic Basis of Disease, 7th ed. Elsevier Saunders, Philadelphia, 39-40.